One day a friend handed over to me a bundle of rose quartz and amethyst crystals of various sizes and shapes with an instruction - “do whatever you can with this”. They are actually from/for his sister. Wow! This is a challenge for me as I have never done a wrap before as my beads/crystals normally come with holes on them. This gemstones on the other hand have no holes and I don’t know how to drill nor the equipment to do it!!!???. Worst still, they come in different sizes and shapes. Duh!! Duh!! I must admit that I searched the net for a number of days to find the best wrap for these gemstones. 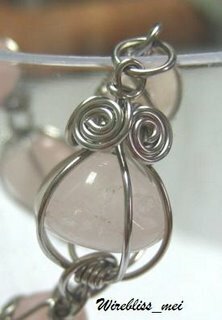 I didn’t find the perfect wrap but found one that I really like from D.K Heath’s (Remy) site – It is actually a free tutorial for Cage Pendant. The link to this free tutorial is http://studioheath.com/tutorials.php. After several try and several yards of wire, I managed to come up with several wire wrapped pieces. 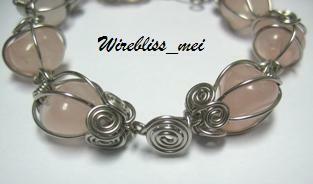 The first of them is this rose quartz bracelet. It is quite bulky due to the size of the crystals in addition to the wrap. I asked my friend what the sister think about the bracelet and he said she is very fascinated with my wrap but didn’t say whether she like it or not and most important whether she is going to put it on or not. Gorgeous, gorgeous...how could someone not want to wear this! I'm sure the recipient will wear it proudly. What size wire did you use with this -- 20 g.? Thank you Debbie. I am glad someone like my piece. I used 20g for this piece.